Elachista poae Stainton, 1855. Entomol. Ann. : 47. Leaf-miner: Narrow, whitish (in the end often reddish brown) gallery of several decimeters in length, descending from the leaf tip to within the sheath of the leaf. Frass dispersed. 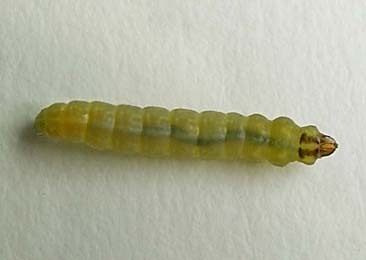 Pupation external (Bladmineerders van Europa). The mine is downwards, towards the stem, and difficult to see. It is initially a pale green and later turns brown. When the larvae reach the water-line, they may then mine upwards or swap leaves (and then mine upwards). The frass is scattered in the mine (which distinguishes it from S.forficella, which has frass in a central strip). Found in the borders of steams, ponds etc. (British leafminers). The pupa is in a slight cocoon, on an unmined leaf, about 60cms above the weater line. See Bland (1996a), Patocka (1999a), Patocka and Turcáni (2005a) (Bladmineerders van Europa). The pupa is illustrated in the Encyclopedia of Life. Adult: The adult is illustrated in UKMoths. The adult is illustrated in the Encyclopedia of Life. The species is included in mothdissection.co.uk. Time of year - larvae: April-May and July-August (Bladmineerders van Europa). Distribution in Great Britain and Ireland: Britain including Caernarvonshire, Cambridgeshire, Cheshire, Denbighshire, East Dorset, Glamorgan, Herefordshire, Hertfordshire, Huntingdonshire, Isle of Wight, Merionethshire, Monmouthshire, North Essex, North Hampshire, North Somerset, Shropshire, South Somerset, Stafford, West Norfolk and West Suffolk (NBN Atlas). See also British leafminers distribution map. Distribution elsewhere: Widespread in continental Europe including Austria, Belgium, Czech Republic, Danish mainland, Finland, Germany, Hungary, Latvia, Lithuania, Poland, Romania, Slovakia, Sweden and The Netherlands (Karsholt and van Nieukerken in Fauna Europaea).